Parallel Strand Lumber (PSL) provides attributes such as high strength, high stiffness and dimensional stability. The manufacturing process of OSL enables large members to be made from relatively small trees, providing efficient utilization of forest resources. In Canada, PSL is fabricated using Douglas fir. PSL is employed primarily as structural framing for residential, commercial and industrial construction. Common applications of PSL in construction include headers, beams and lintels in light-frame construction and beams and columns in post and beam construction. PSL is an attractive structural material which is suited to applications where finished appearance is important. Similar to laminated strand lumber (LSL) and oriented strand lumber (OSL), PSL is made from flaked wood strands that are arranged parallel to the longitudinal axis of the member and have a length-to-thickness ratio of approximately 300. The wood strands used in PSL are longer than those used to manufacture LSL and OSL. Combined with an exterior waterproof phenol-formaldehyde adhesive, the strands are oriented and formed into a large billet, then pressed together and cured using microwave radiation. PSL beams are available in thicknesses of 68 mm (2-11/16 in), 89 mm (3-1/2 in), 133 mm (5-1/4 in), and 178 mm (7 in) and a maximum depth of 457 mm (18 in). PSL columns are available in square or rectangular dimensions of 89 mm (3-1/2 in), 133 mm (5-1/4 in), and 178 mm (7 in). The smaller thicknesses can be used individually as single plies or can be combined for multi-ply applications. PSL can be made in long lengths but it is usually limited to 20 m (66 ft) by transportation constraints. PSL is a solid, highly predictable, uniform engineered wood product due to the fact that natural defects such as knots, slope of grain and splits have been dispersed throughout the material or have been removed altogether during the manufacturing process. Like the other SCL products (LVL, LSL and OSL), PSL offers predictable strength and stiffness properties and dimensional stability. Manufactured at a moisture content of 11 percent, PSL is less prone to shrinking, warping , cupping, bowing and splitting. 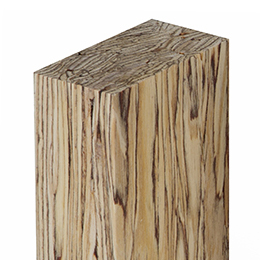 PSL exhibits a rich texture and retains numerous dark glue lines. PSL can be machined, stained, and finished using the techniques applicable to sawn lumber. PSL members readily accept stain to enhance the warmth and texture of the wood. All PSL is sanded at the end of the production process to ensure precise dimensions and to provide a high quality surface for appearance. As with any other wood product, PSL should be protected from the weather during jobsite storage and after installation. Wrapping of the product for shipment to the job site is important in providing moisture protection. End and edge sealing of the product will enhance its resistance to moisture penetration. PSL readily accepts preservative treatment and it is possible to obtain a high degree of preservative penetration. Treated PSL can be specified in high humidity exposures. PSL is a proprietary product and therefore, the specific engineering properties and sizes are unique to each manufacturer. Thus, PSL does not have a common standard of production and common design values. Design values are derived from test results analysed in accordance with CSA O86 and ASTM D5456 and the design values are reviewed and approved by the Canadian Construction Materials Centre (CCMC). Products meeting the CCMC guidelines receive an Evaluation Number and Evaluation Report that includes the specified design strengths, which are subsequently listed in CCMC’s Registry of Product Evaluations. The manufacturer’s name or product identification and the stress grade is marked on the material at various intervals, but due to end cutting it may not be present on every piece. The Canadian Construction Materials Centre (CCMC) has accepted PSL for use as heavy timber construction, as described under the provisions within Part 3 of the National Building Code of Canada.